Caregiver’s Resource for Better Senior Care Supports Springfield Residences. 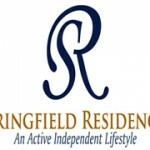 Springfield Residences is a beautiful 104 apartment Independent and Assisted Living Lifestyles located on a serene, secluded eleven acre campus in historic Montgomery County. Springfield Residences offers spacious studio, one and two bedroom apartments, many equipped with kitchenettes and balconies. Our residents maintain their independence and community involvement while knowing that security and nursing personnel are available 24 hours a day. The staff of Springfield Residences combines compassion and affection with state of the art nursing care and the tools necessary to live a full and active lifestyle. We offer activities and entertainment that provide mental stimulation and opportunities to form deep and lasting friendships. Whether it is scheduling a doctor’s appointment, administering medication or providing transportation to the local drug store, we are committed to making sure that every need is addressed. Springfield Residences understands that choosing the right retirement community is not an easy decision. We welcome the opportunity to ease some of that difficulty and provide a warm, friendly environment that is easy to call home. Whether you are completely independent or need assistance throughout the day, Springfield Residences offers you the ability to lead the life you want to live.